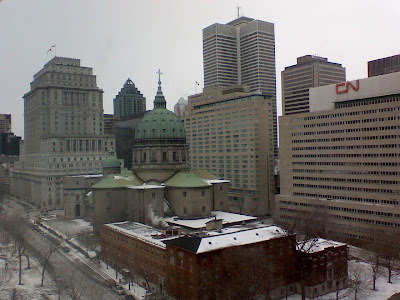 A view of Downtown Montreal from the 13th floor of the Marriott Chateau Champlain. 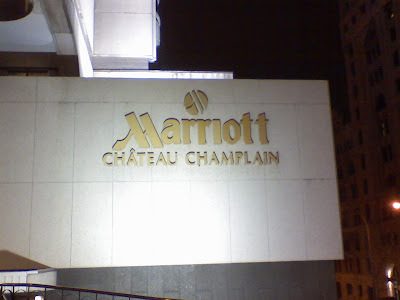 My family and I made a quick visit to Montreal on 12/2/07 and we stayed at the Marriott Chateau Champlain in downtown Montreal. My wife had a get together with her siblings and parents, and my kids got together with their cousins. I hung out with my friend Andy who lives in Montreal. We had dinner in Chinatown and then finished the night at the Peel Pub. We hung out till 1:00AM as we enjoyed our drinks, the pub scene, but more so because we didn't want to walk back to the hotel as it was freaking cold! It was too short for a taxi ride but long enough for a cold walk.